Brittany has it's own kilt now ! I am officially French but above all, I am a Breton born in Brittany, the "French" part of the Celtic world. I recently discovered that since 2001 Brittany had created several tartans which have been officially registered in Scotland including one named the Brittany national, the one I chose to wear. I had always dreamt of wearing a kilt as I have always felt myself belonging to the Celtic universe. As I was to be my best friend's best man, I decided to do her the great honour of wearing that kilt on her wedding day. So I bought it some weeks before the big day and held my purchase secret until the moment I drove her to the church. I must say that my best friend's grandfather was a Scot and she just is extremely proud of belonging to the Celtic world. I just can't describe her reaction on seeing me wearing my kilt, I was so proud of being her best man and the light I saw in her eyes just added to my pride. Moreover, I can say today that she fully appreciated the honour I have done her on that day so special to me. I am looking today for a jacket to wear with my kilt and I must say that I have made up my mind for a Prince Charlie's jacket and vest which I find just beautiful, the only thing is that I just can't afford it for the time being. Indeed, I have to feed and dress (hopefully soon in children kilts) the most beautiful twins ever seen on earth (20 months old). 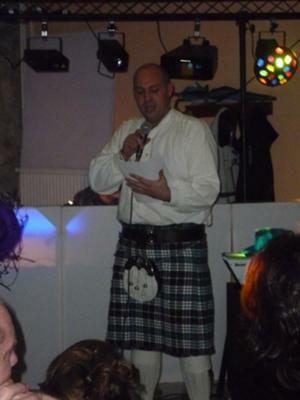 Once again, I am so proud of wearing my national kilt and even though it is quite unusual for a French man to wear one and often source of mockery from ignorants, I will carry on wearing it and making it live. Join in and write your own page! It's easy to do. How? Simply click here to return to Share your kilt story. I wrote some 8 months ago (see the article called Brittany has its own kilt now) to let you all know about the fact that we, people of Brittany are now entitled to wear kilts made of their very own tartans. My last contributions ended up with myself hoping that I would very soon be able to afford to buy a prince Charlie jacket to match my Brittany national tartan kilt. Well, a little fairy heard my wish and made it come true, I now own MY jacket and God knows how proud I am of wearing it. However, my jacket is just one part of the magic, indeed, it arrived along with the most beautiful pair of gillie brogues and the most essential sgian dubh. My wife (you have guessed that she is my fairy) even managed to find my new kilt pin, crested with the arms of Bittany. Besides, I dropped the seal skin sporran for a formal dress rabbit fur sporran. The next step will be to find a fly plaid in the matching tartan to go with the Britanny crested brooch I have already spotted. 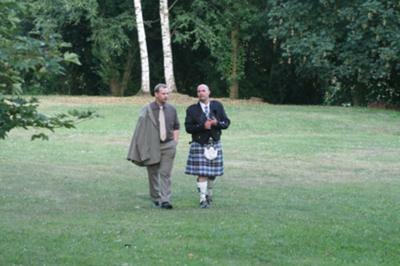 Here is a photograph of me with a friend (his suit looks ok but seems a bit pale compared to the kilt and jacket), if any one of you notices that there is anything wrong in the way I wear my kilt or any of the accessories and you wish to make a comment or give me a piece of advice, please feel free(actually, I know that it is hard to really see well on that picture but it's the only one I have for the moment). Thanks in advance to all of you. Women and the "kilt effect"
Scrolling through the site, I came across a question asked by David, our host on this site, which goes : "why do women find men wearing kilts so attractive ?" 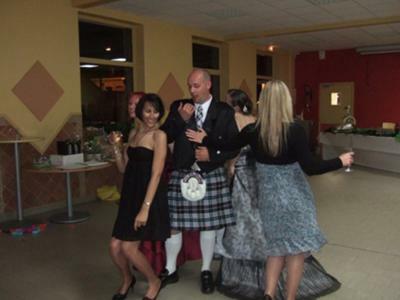 Well, I actually haven't got the answer to that but the ladies around me on the photograph above (taken at a wedding here in France) might give us a clue... I'll ask them next time we meet !!! Below are links to other pages relating to this one.